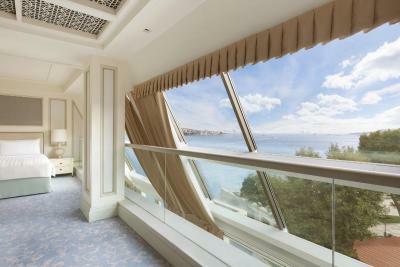 Lock in a great price for Shangri-La Bosphorus, Istanbul – rated 9.2 by recent guests! Excellent and wide variety of breakfast. Nice view. Good location. Very clean. Reasonable price. Large size rooms. Excellent room service. Excellent airport pick up and drop with airport welcome personnel. Every thing is amazing in this hotel. Spicily The staff were friendly and helpful. Location, decor is excellent, hotel size very convenient and breakfast is very good. amazing View; hotel location near many ferry stations was a plus there is a nice shopping area nearby where you can find all your needs. the staff were great, Mr. Halil the concierge was great help to fine tune our plan to explore Istanbul, check in staff were amazing. In my opinion Shangri-La is the best hotel in town, they have above normal service, and friendly employees, they made my stay wonderful, for that it’s hard for me to change the hotel. Special thanks for general manager and all employees thank you for your niceness. I strongly recommend for stay in the hotel. Everything was above my expectation honestly. The location, room view, breakfast, staff was so friendly and nice.. next trip ti İstanbul will sure stay at this hotel..
Shangri-La Bosphorus, Istanbul This rating is a reflection of how the property compares to the industry standard when it comes to price, facilities and services available. It's based on a self-evaluation by the property. Use this rating to help choose your stay! Shangri-La Bosphorus, Istanbul is located between Dolmabahce Palace and Naval Museum on the European coast of the Bosphorus. This luxurious hotel offers an indoor pool, CHI, The Spa and elegantly decorated rooms with modern amenities. The rooms feature contemporary décor with Asian highlights. Each room is equipped with high-tech products, free high-speed internet, a flat-screen TV and an iPod docking station. 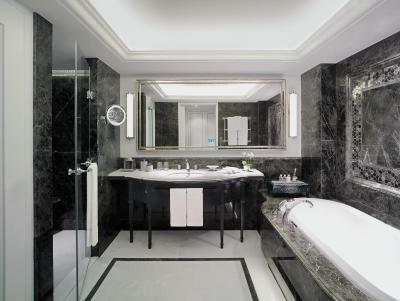 The marble bathrooms have heated floors and Bvlgari toiletries. IST TOO serves selected dishes of world cuisine including Japanese, Southeast Asian, Mediterranean and Turkish flavors. Shang Palace, hotel's signature restaurant is Shangri-La's culinary introduction to the city of Istanbul. Shang Palace offers delicacies of Chinese cuisine with a refined and contemporary décor. Lobby Lounge is an ideal place to enjoy the special performance of Kung-Fu Tea Master and taste more than 100 types of Chinese teas and pastries. Besiktas Ferry Port is just a few steps from the hotel. 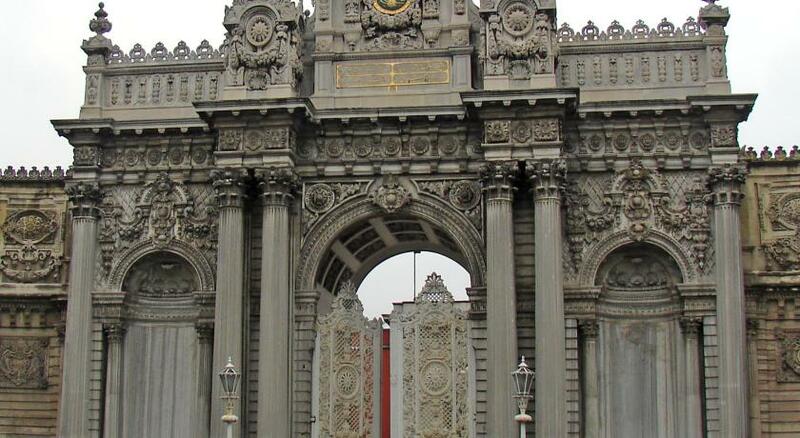 Taksim Square is within 1.2 mi, Ataturk Airport is 17 mi away while Istanbul Airport is 33 mi from the property. Free private parking is available on site. 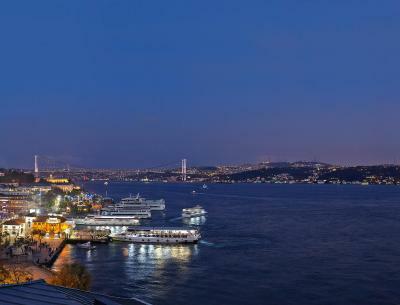 When would you like to stay at Shangri-La Bosphorus, Istanbul? Featuring luxurious furnishings, this spacious room has views of the atrium from a French balcony. 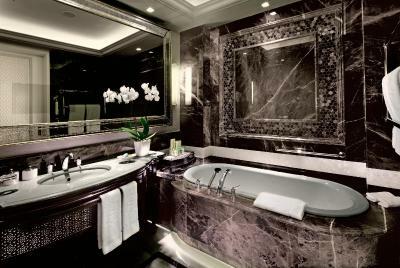 It also has a large marble bathroom with a separate shower and a bathtub. These rooms are on floors 1 to 5. Featuring luxurious furnishings, this spacious room has modern décor and views of the dynamic Istanbul cityscape. It also has a large marble bathroom with either a shower or a bathtub. These rooms are on floors from 1 to 5. 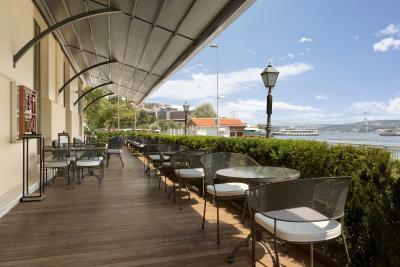 Deluxe Bosphorus Rooms feature cozy surroundings, modern décor and partial views of the Bosphorus. They have large marble bathrooms with either showers or bathtubs. These rooms are on floors from 1 to 4. 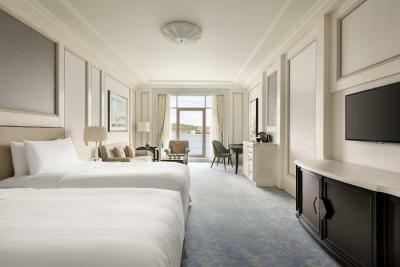 Featuring luxurious furnishings, this spacious room has modern décor and views of the Bosphorus. It has a large marble bathroom with a shower or a bathtub. Featuring luxurious furnishings, this spacious room has modern décor and floor-to-ceiling windows providing views of the Bosphorus. A floor-to-ceiling window opens out onto a spacious terrace with views of the Bosphorus. It has a large marble bathroom with a shower or a bathtub. These rooms are on the 5th floor. On the 1st to 4th floors, this suite includes a bedroom and a separate living room. 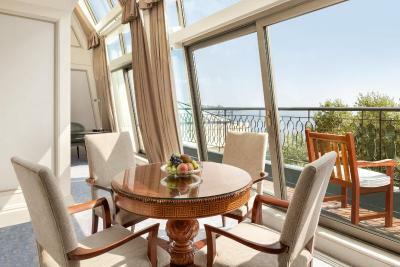 This one bedroom suite has partial views of the Bosphorus Strait. 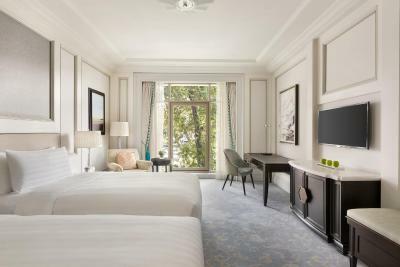 Featuring luxurious furnishings, this spacious suite has modern décor and floor-to-ceiling windows providing views of the Bosphorus Strait. The suite also has a living room with a separate bathroom. These suites are on the corners of 3rd and 4th. 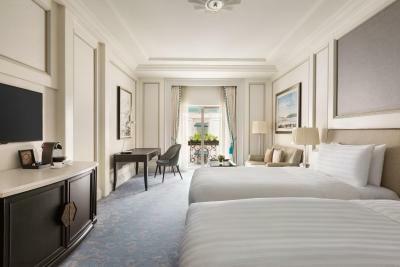 This suite provide the most expansive, double-height windows of in the hotel and offers views of Dolmabahce Palace, Kiz Kulesi (Maiden Tower) and the Old City. 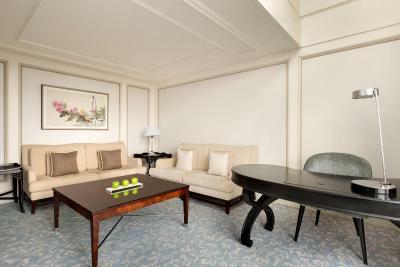 Each bright and airy suite features a living area on the lower level and a small terrace. The bedroom is located intimately on the upper level. This room opens onto a private terrace with partial views of the Bosphorus that overlook the bridge between Europe and Asia. It is on the fifth floor. 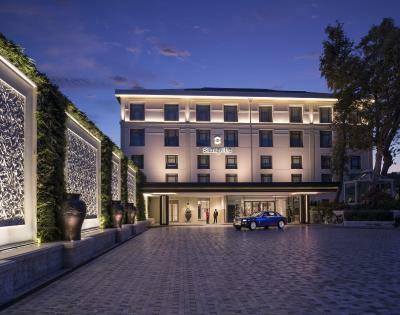 A unique hotel brand in Turkey blending Asian style with Turkish hospitality; offering breath-taking views of the Bosphorus Strait and ideally located in Besiktas, Shangri-La Bosphorus, Istanbul features a sanctuary with the most spacious guest rooms in the city in all of its 186 luxurious guestrooms and suites. 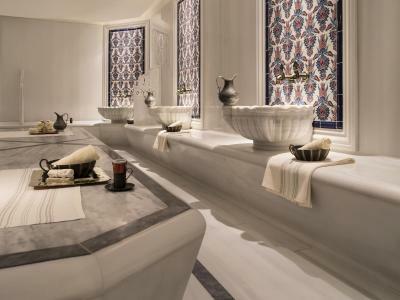 House Rules Shangri-La Bosphorus, Istanbul takes special requests – add in the next step! Shangri-La Bosphorus, Istanbul accepts these cards and reserves the right to temporarily hold an amount prior to arrival. Please note that the credit card used at time of booking needs to be presented during check-in. Breakfast was the same everyday....unlike other 5 star hotels which was quite disappointing. Bed was very comfortable, bathroom has warm tiled floors (which was nice during the cold season). Mr. Oktay at the reception was very attentive and made our stay comfortable. We also tried the Chi Spa which was very nice, especially our therapist Ms. Kita. 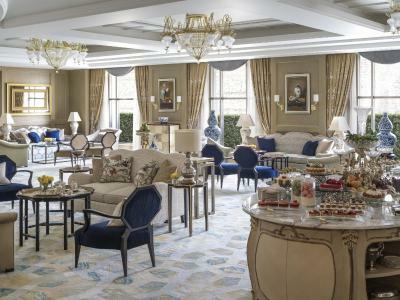 Great location, marvellous view to the Bosphorus, beautiful and spacious rooms, very helpful staff especially the concierge, lovely breakfast and just an overall luxurious facility. The only thing that I regret this time, is the feelings that something has changed, 1- first the smell of the rooms, the entrance and lobby, since six years we were use to a very delicate parfum that was the signature of Shangri-La. Also before they use to have a lot of flowers everywhere! I hope they will not change anything of it. But I do understand that the situation economic has changed in Turkey and maybe those details are costing much to expensive now. I adore Shangri-La, it have been 6 years that we book with Booking.com for Shangri-La, at list two times a year. I specially enjoy the spa and all those treatments, Turkish Kesseh, Thai massage, the swimming pool is heated and so enjoyable. The personal is very qualified and kind. The rooms are beautiful and pretty big in m2.